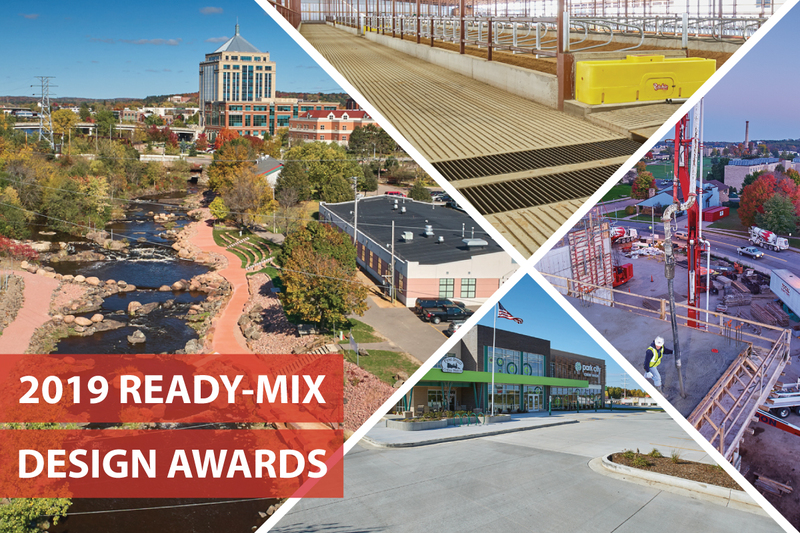 County Materials congratulates the contractors, engineers, and designers who were recognized at the Wisconsin Ready-Mix Concrete Association’s 37th Annual Concrete Design Awards. The award program is part of a prestigious event showcasing the best uses of ready-mix concrete in Wisconsin and Michigan’s Upper Peninsula. Construction professionals selected entries based on use of ready-mix, engineering design skill, unique design demands, aesthetics, construction techniques and challenges, and integration to the site. Contractors for the award-winning projects were honored at the WRMCA Concrete Design Award Ceremony on Thursday, February 7th, at the Kalahari Resort in Wisconsin Dells, WI. Milis Flatwork, Spiegelberg Implement, and Everlasting Concrete were awarded in the Agricultural Category for their work on the Spring Breeze Dairy Farm located in Bryant, WI. This dairy farm required extreme engineering design skill and coordination of many parties. County Materials supplied more than 11,000 cubic yards of ready-mix that was used to construct new facilities including a manure pit, several barns, a storage shed, a milking parlor and pathways connecting buildings. In addition, there were more than 20 different design mixes used throughout this project. Miron Construction was awarded in the North Central Region Category for their work on the University of Wisconsin Stevens Point Science Building. The science facility required a strong concrete super structure and post tension system to dissipate equipment noise and vibration, maintaining a quiet learning environment. Ready-mix was the most utilized building materials or the science facility, making up approximately 75% of the structure. Precision Grading & Utilities was recognized for their work on the Wausau White Water Park in downtown Wausau, WI. This project won in the Special Merit Category. The park is a third-mile long whitewater course used for regional and international competitions. The project was awarded for its upgraded pathways constructed with integrally colored ready-mix. The new pathways run immediately along the edge of the Wisconsin River bank, creating several construction challenges. The finished project better suits the course to host major events. Lewis Construction was awarded in the Special Merit category for their work on the Park City Credit Union parking lot, located in Merrill, WI. Ready-mix was selected on this project for its ease of maintenance, strength, low lifecycle costs, and light reflectivity. In all, 1,541 cu. yds. of ready-mix was used to create the parking lot and several additional features including islands and planting beds. County Materials congratulates all the participants and winners in this year’s concrete design awards.